EVERETT, Washington, February 17, 2012 (ENS) – President Barack Obama today toured Boeing’s aircraft assembly plant in the world’s largest building just north of Seattle, where the manufacturer’s newest plane – the fuel-efficient 787 Dreamliner – is being built. “Air Force One was built right here in Everett 25 years ago,” President Obama told a crowd of about 500 Boeing workers and executives from across the Puget Sound region. In the crowd was one of the men who had helped build Air Force One and during the tour, he met the President. “As wonderful as it is to fly Air Force One, and it is wonderful, it’s hard not to be amazed by the Dreamliner,” said Obama. He was particularly pleased with the environmentally-conscious features of the new mid-size plane. “This is the first commercial airplane to be made with 50 percent composite materials,” Obama said. “It’s lighter, it’s faster, it’s more fuel-efficient than any airplane in its class. And it looks cool,” he said to laughter and applause. Four key technologies contribute to a 20-percent improvement in fuel use for the 787 Dreamliner as compared to today’s mid-sized planes – new engines, lightweight composite materials, more efficient systems applications and modern aerodynamics. With reduced fuel use comes an equivalent reduction in carbon dioxide emissions and a 30 percent reduction of nitrogen oxides below today’s 767s, Boeing says. 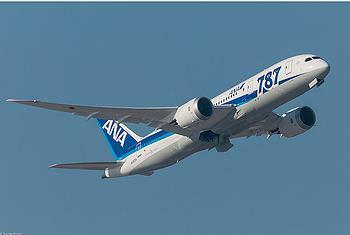 The 787s will be quieter on takeoff and landing than existing planes of their size. Acoustically treated engines and body parts are aimed at keeping all sound above the level of loud vehicle traffic within airport boundaries. The mid-sized Dreamliners will enable airlines to offer more direct flights between mid-sized cities. This eliminates the need for connecting takeoffs and landings and uses less fuel, which means fewer emissions. 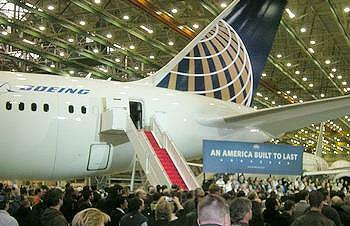 Obama praised Boeing for manufacturing the planes in the United States. “The Dreamliner is the plane of the future, And by building it here,” he said, “Boeing is taking advantage of a huge opportunity that exists right now to bring more jobs and manufacturing back to the United States of America. Located just north of Seattle, Boeing’s Everett assembly plant will be kept busy filling the orders for 870 Dreamliners that the company has already received, directly employing nearly 8,000 people across the country to do so. In addition to the 787 Dreamliners, this factory is where Boeing 747s, 767s and 777s are built. Boeing’s success means success for many smaller businesses. The company works with nearly 11,000 small, medium and large supplier businesses in all 50 states, providing goods and services like the airplane’s ground-breaking carbon fiber composite aircraft structure from Kansas, advanced jet engines from Ohio, wing components from Oklahoma, and revolutionary electrochromic windows from Alabama. More than 80 percent of the Dreamliners already on order are destined for airports in more than 25 countries, including Japan, Australia, China, France and Singapore. Ethiopian Airlines, one of the strongest airlines in Africa, will take delivery of some of the first Boeing 787 aircraft later this year, a transaction made possible in part by support from the Obama Administration. 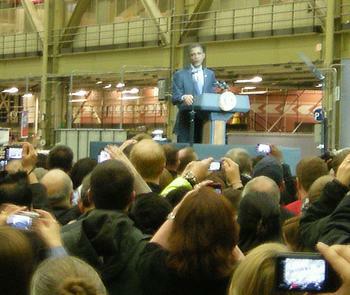 “Two years ago, I set a goal of doubling U.S. exports over five years,” Obama told the Boeing crowd. “Today, we’re on track to meet that goal – ahead of schedule. But we need to do more, which is why I’m pleased to announce several steps that will help more American businesses sell their products around the world, create jobs right here at home, and help us build an economy that lasts,” said Obama, using the phrase that has become his election season mantra. Exports are up nearly 34 percent over the level of exports in 2009, exceeding $2.1 trillion in total value in 2011, the White House said in a statement today. Manufacturing represents nearly 60 percent of total U.S. exports, and Boeing is one of the country’s leading exporters of manufactured goods with more than $34 billion in total exports in 2011, up over 45 percent since 2006. The President used the Boeing event as a platform to announce a series of executive actions in support of American manufacturing enterprises that make use of the financing services of the Export-Import Bank. Obama announced a new credit opportunity for small business exporters, Global Credit Express, to help them access hard-to-find short-term working capital lines of credit. Working with their existing lenders, small businesses will be able to apply directly to the Export-Import Bank for six to 12 month loans of up to $500,000. The White House said that this year, the program could help small exporters access up to $100 million in capital funding. “I’m also instructing the Bank to give American companies a fair shot by matching the unfair export financing that their competitors receive from other countries,” Obama said. The administration “will actively employ its existing authorities” so that the Export-Import Bank can provide U.S. firms competing for domestic or third-country sales with matching financing support “to counter foreign non-competitive official financing that fails to observe international disciplines,” the White House said. At the same time, Boeing today committed to join the Export-Import bank’s Supply Chain Financing Program, which helps firms advance funds against export-related contracts, providing liquidity and working capital more quickly and on better terms. Through this partnership, Boeing’s small business suppliers will be able to access over $700 million in short-term credit this year. Obama established the Export Promotion Cabinet by Executive Order on March 11, 2010. Today he issued a Presidential Memorandum which gives the body stronger authority to align interagency efforts to maximize combined effectiveness of their programs and initiatives. The Memorandum also directs the Export Promotion Cabinet, in consultation with the Trade Promotion Coordinating Committee, to evaluate resource allocations, make recommendations for streamlining overlapping or duplicative programs, and create a unified Federal trade budget. Obama also requested that Congress reauthorize the Export-Import Bank and work with him to bolster the manufacturing sector by passing changes to the tax code. Finally, the administration today officially launched BusinessUSA, a virtual front door to government assistance of all kinds. Developed with input from U.S. businesses, BusinessUSA implements a “no wrong door” policy for small businesses and exporters by using technology to quickly connect them to the services and information they need, regardless of where the information is located or which agency’s website, call center, or office is the right one to help them grow, hire and export.